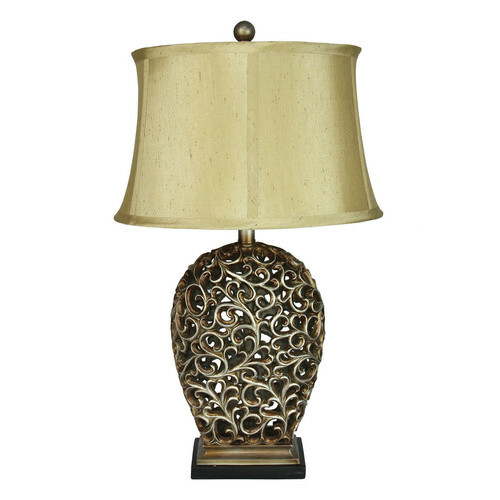 Ideal for the formal rooms in y home, the Donati filigree table lamp is finished with a classic antique wash and wenge timber pedestal base. Complimented by an aged-gold shantung, lined empire soft-back shade and finial top piece. Donati's base is oval in profile. The switch is conveniently located on the cord. When you buy a Donati Complete Table Lamp online from Temple & Webster in Australia, we make it as easy as possible for you to find out when your product will be delivered to your home in Melbourne, Sydney or any major city. You can check on a delivery estimate for the Oriel Part #: OL97973AS here. If you have any questions about your purchase or any other Lamps product for sale our customer service representatives are available to help.Whether you just want to buy a Donati Complete Table Lamp or shop for your entire home, Temple & Webster has a zillion things home. Products were true to description. Very pleased with all products purchased. Very PROMPT delivery.. Thank you..
Having painted my living room teal blue I wanted more gold to complement it, the 2 lamps I bought do just that. Complemented by off white furniture - result: beauty! Awesome! Way more than I expected! Beautiful in my music room atop the piano! The shade is remarkable elegant.